Watercolor set of weather forecast. 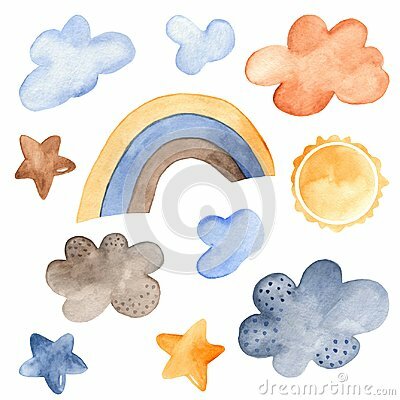 Illustration of clouds, rainbow, sun, stars on white background. Grunge hand drawn sun. Vector, isolated. Hand drawn clouds with rain and snow. Set of vector clouds. Design elements. Vector clouds doodle collection set. Weather hand drawn forecast elements. Set of blue watercolour drops. Weather icons, clouds and sun. Vector design of weather and climate logo. Set of weather and cloud vector icon for stock.